Infinity Wars: Weapon Hex #1 review: Human at its core – AiPT! Weapon Hex #1 is one of the strongest character introduction spin-offs Infinity Wars has produced. 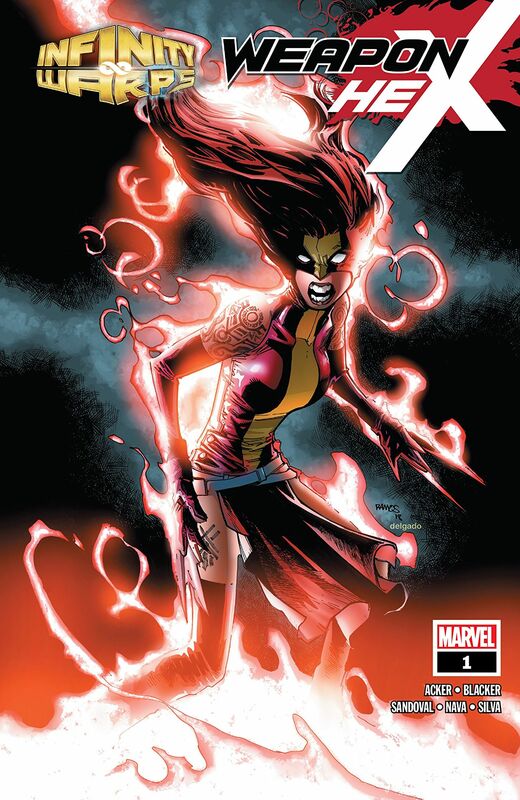 With pain and regret ranking high as motivations for just about every character in Marvel’s Infinity Wars, it makes logical sense that the newly introduced Weapon Hex would find both at the center of her being. From her literal conception to her evil debutante night on the top of Mount Wundagore, Weapon Hex discovers her own humanity through changes in her mother, the only person in her life to treat her as such. From big fight scenes to intimate moments, Weapon Hex #1 is one of the strongest character introduction spin-offs Infinity Wars has produced. How she fits into the larger story, however, is still a mystery. Weapon Hex, or, Laura, as her mother calls her, is born of necessity when attempts to provide the dread demon Mephichthon an earthly vessel. Imbued with multiple genetic anomalies and magical energy at birth, she grows into the killing machine her parents always dreamed of. Kind of. Her father, Herbert, considers her to be a thing, a vessel only. Her mother, Sarah, on the other hand, knew from the beginning that her daughter would be more than a shell. After brutal training in fighting, especially with her retractable claws and magic, she is forced to defend her home against an invasion. Her training with Hellhound, along with the fighting on the mountain, is brutal, preparing her for the inevitable possession. Like both Scarlet Witch and X-23, the women mashed up into her in this Infinity Warp, Weapon Hex is a controlled weapon with a moral and feeling human being trapped inside. Killing Elsa Bladestone and her Covenant traumatizes the young woman. After nearly dying at the hands of the Midnight Guns, X-23 questions her purpose for existing. When Sarah tries to rescue her from the mountain before “M-Day,” however, Herbert locks a targeting spell on Sarah, forcing Laura to slaughter her own mother, the only person who ever loved her. In her dying moments we discover that X-23 isn’t the final child of the experiment. Another exists, a sister: Speed Weasel. I adore the mashups that Infinity Wars has provided us, but I’m in the weeds on this one. I’ll do some more research to determine all the mashups I can, but I have a bit of an issue not being able to tell even half of who some people are. I do adore, however, the names of the spells Weapon Hex casts. Writers Ben Acker and Ben Blacker are known outside of comics for their cleverness and spells like “Hexual Healing” and “Hexpulsion” give just enough levity to a fairly dark book. Artist Gerardo Sandoval does a great job with the gothic theme of the whole comic to bring the magical brutality to life. Out of the spin-off comics from Infinity Wars, Weapon Hex is quite different and probably the newest feeling story of the bunch. With the introduction of Speed Weasel and the continuing shadow of Mephicththon, X-23’s future is bleak. I can’t wait to see where she fits into the larger story. Out of the spin-off comics from Infinity Wars, Weapon Hex is quite different and probably the newest feeling story of the bunch. With the introduction of Speed Weasel and the continuing shadow of Mephicththon, X-23's future is bleak. I can't wait to see where she fits into the larger story.